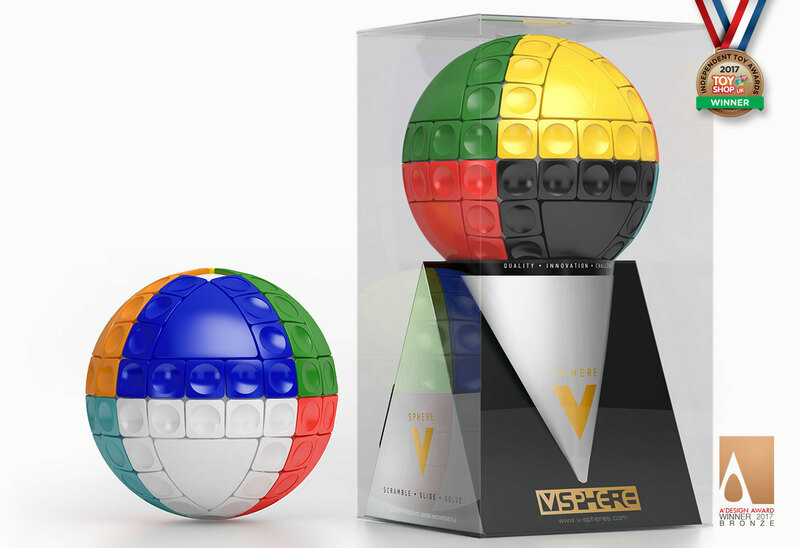 The V-Sphere™ is an eye-catching, innovative spherical sliding puzzle that will challenge, excite and amaze male and female people of every age! It is a light but sturdy puzzle with permanent vibrant colors and a very smooth operation. Everyone will immediately stick with the sphere once its scrambled and will leave it from their hands only after have it solved! V-Sphere™ consists of 8 fixed colored spherical triangles. The 7 of them are surrounded by 12 colored moveable rectangular pieces while the latter triangle is surrounded by 11 pieces, leaving always an empty space. This space helps the user to match the rectangular pieces to the fixed triangles of the same color, while sliding the moveable parts around the sphere. The sophisticated puzzle concept combined with the highest European manufacturing quality, warranties the ultimate user satisfaction. This product was added to our catalog on 19.01.2018.